With the centennials of the events of the First World War and the sesquicentennial of those leading to Confederation this is a busy time in terms of commemoration. And, as both are presented as different kinds of birth of a nation, we’re paying a lot of attention right now to questions of identity. The trouble is the two narratives fit awkwardly together. The debates and accommodations of the Charlottetown and Quebec Conferences seem a world away from the bloody (and more exciting) fields of war. How do we remember who we are? The First World War seems to hold the upper hand here. (Though see Sarah Glassford’s post about competing commemoration in PEI.) It’s easy to see why the nation forged in fire narrative is attractive, of course. It’s cinematic and straightforward, and the association between soldiering and manliness, for a country as well as an individual, is a familiar and comfortable trope. While easy in some ways the effort to remember the war as unifying does require some acrobatics given the actual severity of the fracturing: most sharply between French and English Canada, but also encompassing regional, class, and ethnic discontent. But perhaps it doesn’t need to be one or the other – a nation born out of the war or one almost broken by the war. If a national coming of age is like a personal one, then perhaps it is more properly associated with more subtle changes. The reaction to and experiences of one group who stood awkwardly apart from the sense of wartime unity might be illustrative of a more nuanced understanding. The Military Service Act of 1917, conscripting Canadians to fight overseas, angered much of French Canada. One quieter and less organized minority of young men also found themselves particularly at odds with the conscription legislation. They were conscientious objectors (COs): men who refused military service when conscripted because of religious or ethical beliefs that forbade killing or, often, joining the military in any capacity. They’re an interesting group, partly because Canadian conscientious objectors to military service during the First World War constituted a group for whom the role of rebel was particularly uncomfortable. Most objectors were members of religious denominations like the Mennonites or Quakers that had, along with their pacifist tenets, strictures of obedience to authority. In essence they were predominantly young men who would otherwise have been seen as ideal citizens, precisely because of their refusal to commit acts of violence. A letter from one conscientious objector to Prime Minister Borden summed up their dilemma. We are aware that in taking the stand which we have some will consider us to be “shirkers” but this is far from being the case. Some are bound by what seems like a tragic fate to take the lives of our fellow-men whilst they only wish to give their lives for their country – on the other hand some of us are bound to appear the enemies of our country for conscience sake when we wish to serve her with all our powers. The letter asked for a fairly broad exemption from combatant military service. It was not to be. The exemption granted by the Canadian government was limited to members of recognized denominations with clear proscriptions against military service, and so was more a privilege for certain groups than a right available to any Canadian with strong pacifist beliefs. Those who persisted in their dissent despite a lack of recognition were subject to courts martial, imprisonment, or both—practices that were commonplace throughout the Commonwealth. Several were sentenced to life imprisonment, though none served so long. All conscientious objectors, recognized or not, were disenfranchised. They also faced a great deal of opprobrium. The stereotypical image of the conscientious objector, as put forward by contemporaries, was of an effeminate, overly-intellectual ninny. Their stubborn insistence on the primacy of their own moral code, rather than on the military obligation agreed upon by their contemporaries was particularly egregious in a period when ideal masculinity held strongly the values of group loyalty, and action over contemplation. The conflation of masculinity, righteous Christianity, and military service was a key element in making the stance of the conscientious objector difficult both for an individual to make, and for the large part of Canadian society to understand. By failing to go along with their fellows, the conscientious objectors were not just being cowardly or lazy, but were privileging an individual, contemplative response over one of group loyalty and action. This, and the encouragement of conformity that wartime promotes, amplified the Canadian public’s suspicion of those determined to assert an individual voice, the stubborn conscientious objector among them. 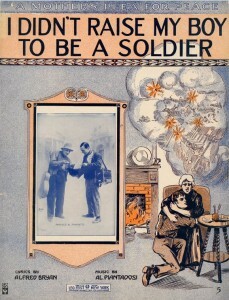 Military service in the First World War was understood to be a duty, possibly the prime duty, of citizenship. In giving primacy to other, non-military duties, conscientious objectors seemed foreign, at a time when unity of belief and behaviour seemed the highest and most necessary good. While most of the objectors were hardly radical in most aspects of their life, what they were asking implicitly was. Conscientious objectors, especially those from outside the historic peace churches, were, whether they knew it or not, demanding quite a radical change in the relations between citizens and the state in treating conscientious objection as a right. And their dissent was important. Members of several religious denominations became more activist after the war, their language changing from a stance that emphasized separation and non-resistance to a focus on pacifism, and working with members of mainstream peace movements in the interwar period. As a result, the Canadian government included both a wider definition of acceptable conscientious objection when conscription was enacted in the Second World War, in addition to options for alternative service through which an objector could still contribute to society without being at least a direct part of the war effort. It wasn’t perfect, but it was more useful than jail. Attitudes about accommodation, and about the relationship between citizenship and military service were changing. 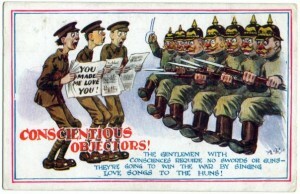 Significantly, conscientious objectors were not disenfranchised during the Second World War. Their experience is not part of the popular narrative of the war, which is something of a loss because if we ignore the punishing of dissenters we also miss the later efforts to accommodate them. (We also miss some insight into the dangers of turning soldiers into the ultimate citizens.) What if we didn’t try to hide the complexity and dissent, and thought of the First World War as a step towards nationhood in a different way? What if the fractures were emphasised as well, as steps in the laborious negotiation of rights and responsibilities required of a diverse modern country? Amy Shaw is a faculty member of the University of Lethbridge’s History Department, and is the author of Crisis of Conscience: Conscientious Objection in Canada during the First World War, as well as the co-editor (with Sarah Glassford) of A Sisterhood of Suffering and Service: Women and Girls of Canada and Newfoundland during the First World War, both with UBC Press. Upon researching a fallen soldier from my hometown, I came across an individual who was drafted in 1917 and soonafter jailed for three years as a conscientious objector. I was tipped off regarding his story due to his peculiar date of death — November 10, 1918. I had assumed he died in the taking of Mons (a controversial moment in war as it was needless….). However, it soon became apparent this soldier died at Burwash due to illness. His name was not placed on the local cenotaph but he does have a CWGC headstone. My question: should he be included on the cenotaph? He did not die fighting…but he was a soldier. Is it offensive to think he should be named on the monument? Or is it wrong to forget about this soldier and other objectors…as is the case (until now?!) Its a curious debate!